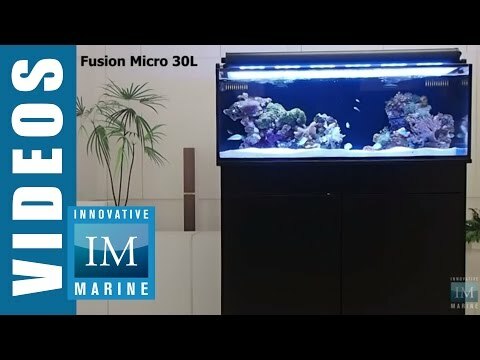 Channel your inner artist and expand your reef keeping possibilities with the NUVO Fusion 30L. 36 inches of unobstrive viewing allows you to create panoramic aquascapes never seen before. Elegance and beauty come together with a purpose to stand apart. I have a Betta fish and I need to know if the flow of the filter can be adjusted? Is it easily accessible in the event I may need to baffle the flow? Pump is easily accessible. Small 1/2" ball valve can be installed for full flow control. Does this tank include lighting? No.Lights are not included with this tank. does the '(2) Removable 3 Stage Filter Baskets' include the three stages of filtration or do they have to be bought separately and be put in. John, Sponge media (2 sets to fit both baskets) is included with each tank. So dealing with the filtration, do you need to buy anything else? It says 3 chamber filtration but in my last question you said in only comes with 4 sponges? What do you do with the other 2 chambers? Just asking if I need to buy something else for the filters. Two AI Prime fixtures with Flex mounting arms would be a good fit for this type of setup. This tank is fantastic, very well designed! I was looking for a long low profile rimless with minimal clutter for my kitchen and this is it. Its very panoramic. The glass is crystal clear and the built in filter wall keeps the counter top and the fish area 100% viewable, clutter free, and easily maintainable. I use one spin stream nozzle (love it!) One custom caddy on one side (love it), the filter sock on the other side (cabinets right above that corner) and I stuff em full of pillow fluff :D works great, very cheap, and my water is always crystal clear. My tank is fresh water with dirt soil, local Tennessee river rock and driftwood, very minimal with lots of grass and random pet shop plants, neon and gouramis. Everything grows nicely and the flow from the nozzles creates very nice currents and circulation within the tank. I keep plants in my center filter chamber and they grow wild back there. I keep the rear chamber lit 24/7 LED as a day/night light and l use strips of towel to grow algae on both the center filter partition glass. I paperclipped the towel strips to the glass overflow so I can easily remove the algae and put the towel back on clean. The mesh top is nice if you have escape artists, but I prefer mine open top. The glass is beautiful all the way to the beveled edges. Shipping, packaging, and customer service was quick and professional from Aquacave, many thanks!